T.J. McDonald's first career interception came when he picked off Saints quarterback Drew Brees in Week 15. ST. LOUIS — Rookie safety T.J. McDonald heard from a former Pro Bowler after he grabbed his first interception of the season. His father, Tim, played 13 years in the NFL with the St. Louis/Phoenix Cardinals and the San Francisco 49ers as a strong safety. He earned Pro Bowl honors six times. He currently is a secondary coach for the New York Jets. The 6-foot-2, 219-pound McDonald picked off Saints quarterback Drew Brees on New Orleans’ first play after the St. Louis had to punt Sunday. That set the tone for the game. The Rams scored on their first play on a 31-yard catch and run by tight end Cory Harkey. St. Louis went on get a 27-16 victory. "He called and congratulated me," McDonald said of his father Thursday after practice at Rams Park. "He told me it was a good play. Him being a coach, he analyzed the play a little bit and whatnot. We talked about it. Hopefully, we can talk about another one pretty soon. "We always talk football. He’s helping me to be the best football player I can be. I think it’s an advantage for me." McDonald, a third-round selection, earned the start at strong safety in his first NFL game. He played on all 70 snaps on defense and recorded seven tackles in the 27-24 win over Arizona. His progress was slowed when sustained a broken leg Sept. 26 against San Francisco in Week 4. McDonald got "leg-whipped" on the play. The injury landed him on the injured reserve/designated to return list and kept him out for the following eight weeks. He returned in Week 12 for a home game against Chicago. "Don’t get me wrong, it was a scary situation," McDonald said. "I was just getting in the groove of things and I wanted to keep going. I had to put it on pause a little bit. I was definitely hungry to get back on the field." McDonald is back and getting into the flow in the Rams’ defense. Before he got hurt midway through the 49ers game, McDonald had 18 tackles and a pass breakup. He earned his spot in the starting lineup against Chicago. He had six tackles. However, McDonald noted his return to the field left him scrambling to make up for lost time. "Coming back mentally, I felt good," McDonald said. "I feel like I’m taking good steps since I’ve come back. I can’t get back all the reps and game time I missed but I’m going forward." Rams coach Jeff Fisher said McDonald has done well. "Well, he’s just getting better and better," Fisher said. "In his first game back, he had a little trouble decelerating, which is understandable because of the injury." 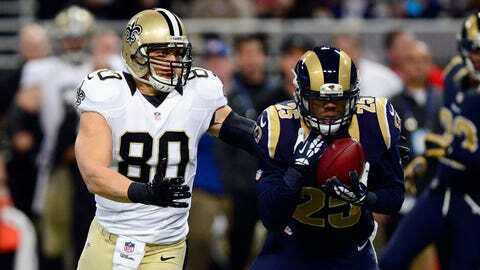 The interception was aided by defensive end Robert Quinn, who hit Brees as he was throwing to tight end Jimmy Graham. Watching film aided McDonald on the play. "It was something we had seen on tape," McDonald said. "Graham came in motion and ran a seam route. We got some great pressure from Rob and the D-line. I was just able to make the play. I didn’t think it would take this long to get my first interception and I hope it doesn’t that long to get the next one." McDonald played all 86 defensive snaps against New Orleans. He also saw time on six special teams plays. He finished with five tackles, an interception and a pass defended. That’s the kind of game defensive coordinator Ray Walton said he expects from McDonald. "He’s flying around and he’s tackling well with a lot of aggression," Walton said. "We’re very pleased with him. He’s doing all the things you need to do as a safety." As for the first interception, McDonald kept the ball. "I got it put back, most definitely," McDonald said. NOTES: WR Tavon Austin (ankle) and did not practice. Austin, who was hurt against Arizona and missed the game with New Orleans, is walking now without a boot. … RB Daryl Richardson (thigh) did not practice. … LB Will Witherspoon and T Mike Person missed practice because of illness.